1. Rainwater collection: is pervasive. 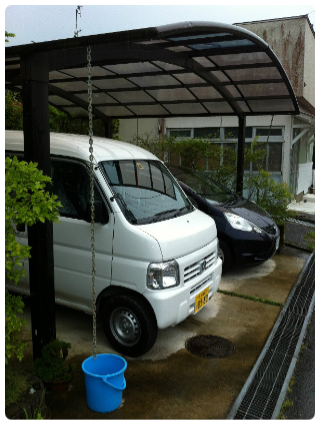 We witnessed many homes with car ports where the gutters were attached to rain chains and buckets (see picture). 2. Bathing: use of water is low because families use a quick 1 minute (soap up then rinse only) shower followed by a shared 50 gallon tub of bath water. 3. Laundry: is grey water for many families. Laundry machines are often located near the family bath. Home improvement stores sell special long hose pumps that pump all the bath water into the laundry machine. 4. Dishwashing: is usually by hand, the same way that baths are done. They wet everything in a bucket, soap and clean the dishes with the faucet off, then rinse. Just a few gallons to wash the day's dishes instead of 40 gallons for a dishwasher. 5. Toilets: often have hand washers attached. After a flush, the water that refills the bowl comes out of a faucet where hands can be washed before that water enters through a hole in the toilet bowl lid. Saves a few gallons per day.